Choose Amerec AK10 that will change the outlook of your master bath suite or a shower enclosure to a luxurious spa. Leave your stress behind with Amerec AK10 generators that are easy to install and give you hassle-free operation. How does Amerec AK10 work? How does Amerec AK10 steam generator work? As per a recent statistics, the amount which people spent in using spa services in the past 12 months (2016) amounts to a whooping 16.75 billion. Spa treatments such as massages, saunas are one of the major business makers not only in USA but also worldwide. But with steam bath generators such as Amerec.com, you can actually beget spa-like experience right at your home. While it is hard to alleviate certain stress levels, products such as Amerec AK10 steam generator support you in getting rid of tired muscles. Amerec AK10 steam generator recreates the spa-like effect by providing soft stream that feels like massage on your tensed muscles. While the initial investment is definitely a chin-scratcher, long term benefits make the product definitely worth a try. The company offers you a fantastic warranty of five years. The AK10 generators deliver optimum performance. One of the reliable products ever designed, it comes with innovative features that make steam bathing a relaxed and comfortable experience. Amerec generators and accessories have best interest in safeguarding your health and energy bills. Keeping that in mind, they offer you only the best of technology. Inside the steam shower (i.e. interior) controls include low voltage. They are usually installed around 48” from the floor distance. They are installed in such a way that it is far from the steam outlet head but within reach to the bather. Make sure to install at least one inside steam shower control. This will assist you to adjust the steam while relaxing. Additionally, using interior control offers simple operation for infrequent steam bathers and guests. When you are using a single interior control, you need to consider installing it in close proximity to the door for easy turn on and off. Outside the steam shower i.e. outside/exterior control is easy to install anywhere you feel convenient. While exterior controls are great when you are starting a steam bath, it can be inaccessible if you are inside the shower and want to turn off the generator or adjust the climate inside. Leaving the decision to the steam shower to make adjustments can be unpleasant. If you need to have an outside controller, make sure to get a secondary control inside the steam shower as a safe and convenient option. Amerec AK10 comes with dual electronic timer and On/Off temperature control. The dual steam generator control operation allows the person to adjust the steam bath settings using two controls – both inside and outside the steam shower. Adjustable between 100-125 degrees Fahrenheit, it gives you a soft flow of subtle steam. Once it attains the required temperature level, the control automatically cuts down the steam thus reducing a much soft and billowing steam for a relaxed steam bath. If the temperature of the sauna drops for more than 5 degrees, both the elements will autonomously engage again. You also have the option to order the Amerec AK10 control with celsius and 24 hour timer instead of Fahrenheit and a 60 minute standard. The instant steam option activates flow of steam in the room wthin 60 seconds after you turn it on. The auto drain option empties the tank after every steam bath. This will prevent any sediment or residue build-up thus extending the life. You will also find that the steam head comes with a fragrance reservoir. Use it to fill up with some essential oils converting normal steam bath to aromatherapy bath that will act as an extra stress buster. Alter your mood levels with Vapor Proof Mood lighting (also termed as chromatherapy) that offers you light therapy as part of holistic healing. Using color psychology, the combination of colors can trigger a soothing effect on body. When you are exposed to certain color of lighting, it rejuvenates your mind and body improving your focus levels. ASME safety valve – comply with ASME (American Society of Mechanical Engineers). This safety valve acts as a fail-safe while operating any hazardous operating pressure. UL/CSA/CE listed – it ensures that the components and product comply with all the regulations laid by valid authorities such as UL (Underwriters Laboratories), CSA (Canadian Standards Association) and CE (European Commission). There are only little Amerec AK10 steam generator reviews available online. However, the available reviews give mixed reviews about the product. For those who want to enjoy the luxurious spa feel right at home, this is the best way to initiate without spending too much. A better investment for you, consider Amerec AK10 if you want sauna treatment right at your home without paying a penny. The energy bills are minimal and do not add too much on your monthy budget. Users claim the product works efficiently and delivers optimum performance. On the downside, couple of users complained that the product produces less heat than older models. It was tricky to replace the older 10KW unit due to the plumbing lines. They do not have the sam length coming out of the system. It called for some additional copper pipe reworking and soldering. Otherwise, the self-installaion of AK10 went great. I am not giving it 5 star because it gives less steam than older model. Amerec ships anywhere in USA. The company charges a small shipping amount that must be incurred by the customer. The company offers 90 days return policy. Under any circumstance, if you find the product not meeting your expectation, simply return it from the date of purchase. You will be refunded appropriately (minus the shipping fee0. 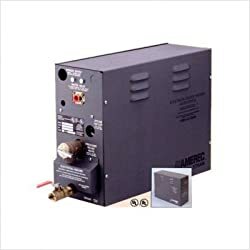 Amerec AK10 standard steam bath generator comes with two year limited warranty on labor and 5 year warranty on parts. Choose discount coupon codes that offer you excellent options for your Amerec steam bath generators. You can subscribe to the blogs and newsletters of Amerec. It will help you grab promotional deals and offers put forth by Amerec. The right kind of Amerec can give you huge discount on Amerec generators and accessories or free shipping. You never know how things might turn to your favor. Why should you buy Amerec AK10 generator? Integrated and innovative functionalities such as soft steam switching, stainless steel reservoir, computerized printed circuit board, electronic controls etc. are few of the features that offer you optimum reliability and performance. From installation to any support required, the customer care is there to give you a helping hand. Where will I find Amerec AK10 owners manual? Amerec AK10 owners manual is included with the package. However, you will find installation and operation manual online at the official website of Amerec. Can I buy Amerec AK10 parts online? Yes, the official website – www.amerec.com offers you spare parts and accessories for your Amerec steam AK10 generator. How much water and electricity does the steam bath generator use? A residential steam generator consumes less than 2 gallons of water for 30 minutes of function. The energy to run the steam generator is quite minimal. Of course, it all comes down to the kW size of the generator. However, based on average kW rate of $.08 per kW hour, it will cost around $.30 to operate a 7kW of steam generator for 30 minutes. How long will it take for the steam bath to heat up so that I can use it? Usually, steam is initiated within 3-5 minutes after you turn on the generator. However, depending on the wall material and construction, it takes additional 10-15 minutes to reach the desired setting for steam bath. Make sure not to enter the bath before the temperature kicks in. Early entry can alleviate the user to achieve healthy benefits of steam bathing. Overall, Amerec AK10 is a decent product that offers you both better monetary and health benefits of relaxing right at your home. Though more customer reviews are yet to arrive, so far the product seems to be having a great rapport with users. To top it the company offers a 90 day return policy. This means you have got good amount of time to test the efficiency of the steam generator. So why wait? Order your own steam generator NOW!!! and get that luxurious relaxation right at your home.